BRAC Bank Limited has won two awards in the ‘ICAB Best Published Annual Reports 2017’. BRAC Bank secured ‘Second Position’ both under the categories of Private Commercial Banks and Integrated Reporting. 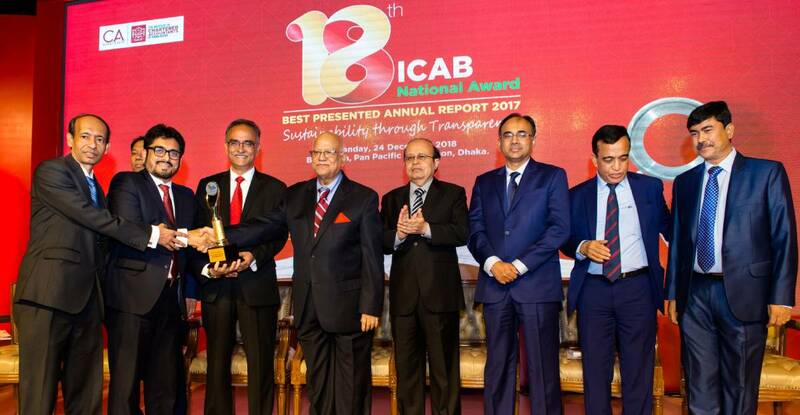 Finance Minister Mr. AMA Muhith, MP formally handed over the award to BRAC Bank’s Deputy Managing Director & CRO Mr. Chowdhury Akhtar Asif at the 18th ICAB National Award Ceremony for the “Best Presented Annual Reports - 2017” at Pan Pacific Sonargaon Hotel on December 24, 2018. Mr. Muniruzzaman Molla, Head of Operations, and Mr. Mohammad Abdul Ohab Miah FCA, Acting Chief Financial Officer, BRAC Bank, were also present. As the winner, BRAC Bank’s Annual Report for the year 2017 has also been nominated for the SAFA BPA Awards 2017 (South Asian Federation of Accountants Best Published Annual Reports) competition as well. He further added, “At BRAC Bank, governance, compliance, ethics and transparency are the cornerstone of our business model. This recognition from ICAB is another acknowledgement of our successful journey towards becoming the ‘Best Bank’ in the country. We gratefully recognize the bank’s valued clientele and stakeholders for their continued patronage and confidence in the organization”. Dhaka, Monday, January 7, 2019: BRAC Bank Limited and bKash Limited signed an agreement for fund transfer facility between BRAC Bank account & bKash account. Under this agreement, the valued customers of BRAC Bank will be able to transfer fund from their BRAC Bank accounts to bKash account while bKash customers will be able to transfer fund from their bKash account to any BRAC Bank account.  BRAC Bank customers will use different Alternate Banking Channel (e.g. Internet Banking or mobile apps) of BRAC Bank. bKash customers will use bKash app or USSD channel to send money to BRAC Bank account from their bKash account. The customers of BRAC Bank and bKash will be able to avail this new fund transfer facility soon. Mr. Selim R. F. Hussain, Managing Director and CEO, BRAC Bank, and Mr. Kamal Quadir, CEO, bKash Limited, signed the agreement at BRAC Bank Head Office on January 7, 2019. Mr. Chowdhury Akhtar Asif, Deputy Managing Director & CRO, Mr. Nazmur Rahim, Head of Retail Banking of BRAC Bank, and Mr. Zafrul Hasan, Head of Enterprise Project Management, Mr. Mir Nawbut Ali, Chief Marketing Officer, Mr. M Mazedul Islam, Head of Legal, Mr. Faisal Shaheed, General Manager, Marketing of bKash Limited, and senior officials of both the organizations were also present on the occasion. Dhaka, Thursday, January 17, 2019: BRAC Bank Limited and Amber IT signed an Employee Banking agreement. Under this agreement, the employees of Amber IT will enjoy multiple benefits that comes with Employee Banking including exclusive Power Bundle proposition. Amber IT is a concern of Amber Group, a conglomerate comprising of 20 companies across diverse industries. Since its inception in 1997, Amber IT has grown consistently and organically as a communications provider serving a diverse portfolio of business class voice and data services. Mr. Nazmur Rahim, Head of Retail Banking, BRAC Bank Limited, and Mr. Mohammad Aminul Hakim, CEO, Amber IT, signed the agreement. Mr. Abul Kalam Shamsuddin, GM, Account & Finance; Mr. A B M Moniruzzaman, GM, Operations; and Mr. Mojibur Rahman, Senior Manager, Admin & HR of Amber IT and Mr. A K M Tareq, Regional Head, Dhaka Central and South-East Region; Mr. Khondker Emdadul Haq, Head of Employee Banking; and Mr. Faysal Haider, Branch Manager, Gulshan Branch of BRAC Bank, were also present at the signing ceremony held at BRAC Bank Head Office on January 16, 2019. 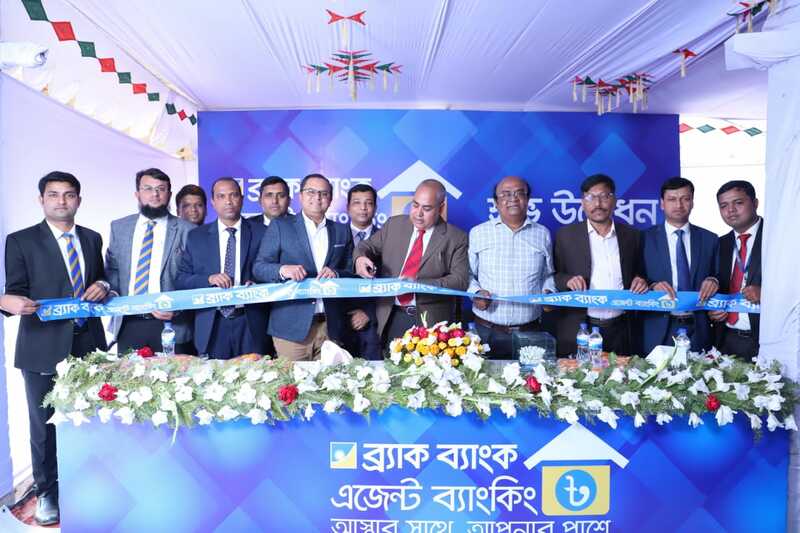 Dhaka, Tuesday, January 22, 2019: BRAC Bank Limited inaugurated Agent Banking outlet at Teknaf in Cox’s Bazar to take banking services to the unbanked people especially in the remote areas of Bangladesh. inaugurated BRAC Bank Agent Banking outlet at Teknaf on January 20, 2019 as the chief guest. Mr. Syed Abdul Momen, Head of SME Banking, Mr. Md. Nazmul Hasan, Acting Head of Agent Banking Department, BRAC Bank, and senior officials of the bank were also present. With introduction of Agent Banking, the customers at the remote areas of the country will be able to avail account opening, cash deposit and withdrawal, DPS, FDR, fund transfer, foreign remittance, utility bills & insurance premium payment, loan disbursement & repayment, government allowance receipt, debit card & cheque book requisition, school fee payment and many more banking services at the Agent Banking outlets. Dhaka, Saturday, January 26, 2019: BRAC Bank Limited and Bishwo Infra Projects Limited signed an Employee Banking Agreement. Bisho Infra Projects Limited (BIPL), a project of Shapoorji Pallonji Group of Companies, is the 5th wealthiest Indian group and ranked 6th largest Solar EPC contractor globally. Under this agreement, the employees of BIPL will enjoy exclusive benefits of Employee Banking services from BRAC Bank. Mr. Nazmur Rahim, Head of Retail Banking, BRAC Bank Limited, and Mr. Narayan Das Rathi, Director, Bishwo Infra Projects Limited (BIPL), signed the agreement at BRAC Bank Head Office in Dhaka on January 20, 2019. Mr. Mitesh Soni, Business Head, SP Group, and Mr. J Sinhamahapatra, Director, Nutan Bidyut (Bangladesh) Ltd, Mr. Khondker Emdadul Haq, Head of Employee Banking; Mr. A K M Tareq, Regional Head, Dhaka Central and South-East Region; and Mr. S. M. Emdadul Haque, Branch Manager, BRAC Bank, were present at the ceremony. Dhaka, Monday, January 28, 2019: The South Asian Federation of Accountants (SAFA), an apex body of SAARC, has awarded BRAC Bank Limited with the SAFA Best Presented Annual Report Awards for Corporate Governance Disclosures, 2017. This is an outstanding achievement for BRAC Bank as the bank has secured this prestigious award two years in a row. BRAC Bank Limited won the most prestigious corporate disclosure awards in the South Asia outshining counterparts in India, Sri Lanka, Pakistan, Nepal, the Maldives, Bhutan and Afghanistan in the Private Sector Banks Category (Including Co-operative Banks). This award has been conferred on BRAC Bank Limited on the basis of evaluation administered by SAFA’s Committee for Implementation in Transparency, Accountability and Governance. Mr. Chowdhury Akhtar Asif, Deputy Managing Director & CRO, and Mr. Mohammad Abdul Ohab Miah FCA, Chief Financial Officer (Current Charge); BRAC Bank Limited, formally received the award at annual SAFA Best Presented Annual Report and SAARC Anniversary Awards Ceremony in Pune, India on January 22, 2019. He further added, “At BRAC Bank, governance, compliance, ethics and transparency are the cornerstone of our business model. This recognition from SAFA for two consecutive years is another acknowledgement of our successful journey towards becoming the ‘Best Bank’ in the country. We gratefully recognize the bank’s valued clientele and stakeholders for their continued patronage and confidence in the organization”. Dhaka, Friday, February 1, 2019: The employees of BRAC Bank organized its annual mini marathon "BRAC Bank DOUR 2019 – The Marathon for Humanity ". Beginning in its journey in 2011, DOUR is the first marathon initiative by a bank in the country and is unique in the way it serves the society through its fundraising philosophy. Mr. Ihsanul Karim, Press Secretary to the Honorable Prime Minister, and Major General Abu Sayeed Md. Masud, BSP, Project Director, Integrated Development of Hatirjheel Area, attended the program at Hatirjheel Project Area on February 1, 2019. Mr. Selim R. F. Hussain, Managing Director & CEO, and Mr. Chowdhury Akhtar Asif, Deputy Managing Director & CRO, BRAC Bank Limited, and the employees of BRAC Bank across the country took part in the mini marathon. The officials of other private banks, corporate organizations and media and film celebrities also participated in the marathon. The marathon started at 7:00 a.m. in the morning. More than 4,000 employees of BRAC Bank, its subsidiaries and other corporate organizations participated in the marathon that began from the Police Plaza Point of Hatirjheel and ended at the same point covering 5 km. The employees raised a fund of Tk. 20 lac, and the bank doubled it to Tk. 40 lac from its CSR Fund. The entire fund was donated to four charitable organizations working for children’s welfare. They are -- Changing Diabetes in Children (CDIC) Programme of BIRDEM Hospital, Deepshikha School, Rights & Sight for Children and Spreeha Bangladesh Foundation. Deputy Minister of Education Mr. Mohibul Hasan Chowdhury Nowfel, Renowned Actor Mr. Akbar Hossain Pathan Farooque MP, Actor Mr. Afzal Hossain, Film Actress Apu Biswas, Film Actress Nipun Akter, Model Afsana Ara Bindu and running icon Mr. Imtiaz Ilahi also joined the mini marathon. Dhaka, Thursday, January 31, 2019: BRAC Bank Limited has recently conducted a half-daylong program on “TARA: Customer Service Experience” at its Head Office for the branch employees. Mr. Selim R. F. Hussain Managing Director & CEO, Ms. Bilquis Jahan, Head of Human Resources, Mr. Syed Abdul Momen, Head of SME Banking & Mr. Nazmur Rahim, Head of Retail Banking were present during the certificate giving ceremony. The workshop was focused on BRAC Bank’s women banking segment “TARA” & the exclusive products & customer service experience BRAC Bank has to offer to their TARA customers. Dhaka, Thursday, January 31, 2019: BRAC Bank Limited organized a workshop on Social Media Marketing for its women entrepreneurs for facilitating and promoting their business. The workshop was arranged for TARA customers and the bank’s women’s employee forum members who run their businesses through social media and plan to grow their business to bigger scale. The workshop titled ‘Networking and Capacity Development initiatives’ was organized in association with Beatnik Creative Design at BRAC Bank Head Office on January 23, 2019. Mr. Ishraque Hossain of Beatnik Creative Design conducted a comprehensive overview on Social Media Marketing for business owners through F commerce business and how to be effective in using the different channels for business. The participants got introduction on new deposit products of TARA. Nazmur Rahim, Head of Retail Banking; Syed Abdul Momen, Head of SME Banking, Mr. Mirajul Huq, CEO, Bagdoom.com; and senior officials of BRAC Bank were present at the certificate giving ceremony. BRAC Bank Limited organized a program on ‘Financial Crimes and Anti-trafficking Activities’ at its Head Office on February 3, 2019. World renowned activist and CEO of Mekong Club, Mr. Matthew Scott Friedman, conducted the session designed exclusively for the senior officials of the bank. Dhaka, Wednesday, February 13, 2019: BRAC Bank Limited has organized a ‘Networking and Capacity Development’ program for its women’s banking TARA customers in Chattogram. The event was jointly organized by Telenor Health’s Tonic, Coopers Bakery Bangladesh and BRAC Bank on February 6, 2019 at the bank’s Muradpur Branch. This event was especially arranged for our valued TARA customers of all age group starting from a Student to Senior Citizens. Women customers showed interest on the value added services that come through TARA in their life. Dr. Khaled Hasan, Head of Clinical Operations, Telenor Health, conducted a session on Healthy Living. TARA customers availed Free Diabetes, Blood Pressure Checkup along with Viva Check medical instruments upto 50% discount and Free Doctors Consultation by expert doctors in Chattogram. They also enjoyed Healthy Baking and Cake Decoration demonstrated by Coopers Bakery. This engagement program is part of TARA’s pursuit for facilitating professional competency development and capacity building of its women customers creating economic opportunities for them. Dhaka, Monday, February 18, 2019: BRAC Bank Limited has signed an Employee Banking Agreement with Shahriar Steel Mills Ltd. (SSRM). SSRM, a leading manufacturer of steel products in Bangladesh, is a valued corporate client of BRAC Bank. Under this agreement, the employees of SSRM will enjoy exclusive benefits of Employee Banking services from BRAC Bank. Mr. SK Masadul Alam Masud, Managing Director; and Mr. Azim Bin Sadeque, CFO & Company Secretary; Shahriar Steel Mills Ltd; and Mr. Tareq Refat Ullah Khan, Head of Corporate Banking; Mr. Nazmur Rahim, Head of Retail Banking; BRAC Bank, were present at the agreement singing ceremony at the bank’s Head Office in Dhaka on February 11, 2019. Mr. A. K. M. Tareq, Regional Head, Dhaka Central and South-East Region; Mr. Khondker Emdadul Haq, Head of Employee Banking; BRAC Bank, were also present. 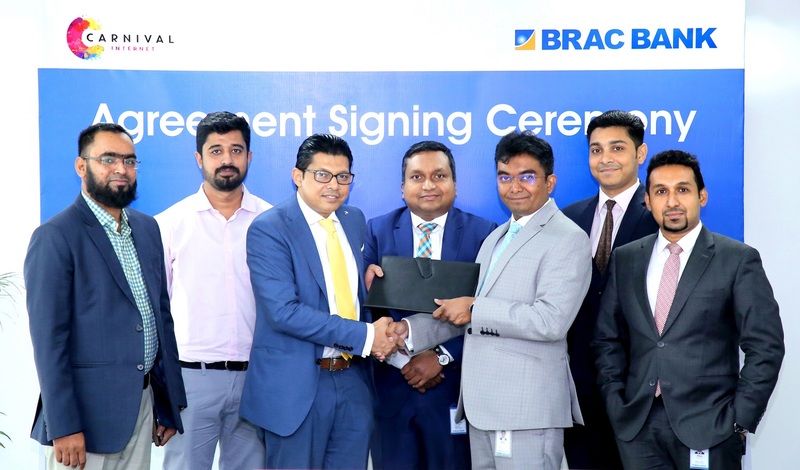 Dhaka, Tuesday, February 19, 2019: BRAC Bank Limited and BProperty.com Limited, largest real-estate market place in Bangladesh, have signed a partnership agreement for joint collaboration in growing House Building Loan portfolio. Mr. Mark Nosworthy, Chief Executive Officer, bProperty.com Limited, and Mr. Nazmur Rahim, Head of Retail Banking, BRAC Bank Ltd, signed the Memorandum of Understanding on behalf of our respective organization at BRAC Bank Head Office in Dhaka on February 10, 2019. Mr. Rejbeen Ehsan, Head of Operations, bProperty.com Limited, and Mr. Dewan Imteaz Ahmed, Head of Retail Lending Products, Mr. Taher Hasan Al Mamun, Regional Head, Distribution Network, BRAC Bank, were also present at the signing ceremony. 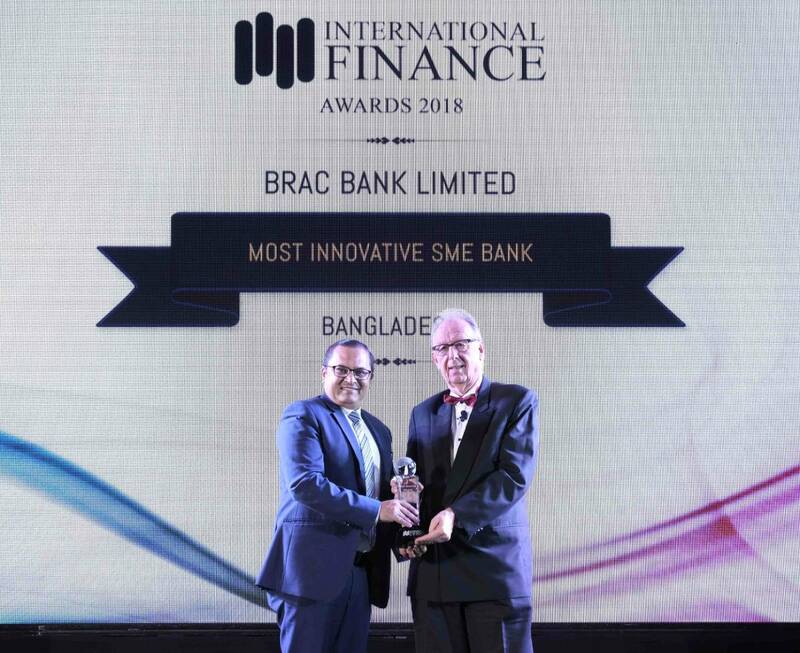 Dhaka, Saturday, February 23, 2019: BRAC Bank Limited has won “Most Innovative SME Bank” Award from International Finance Publications Ltd. 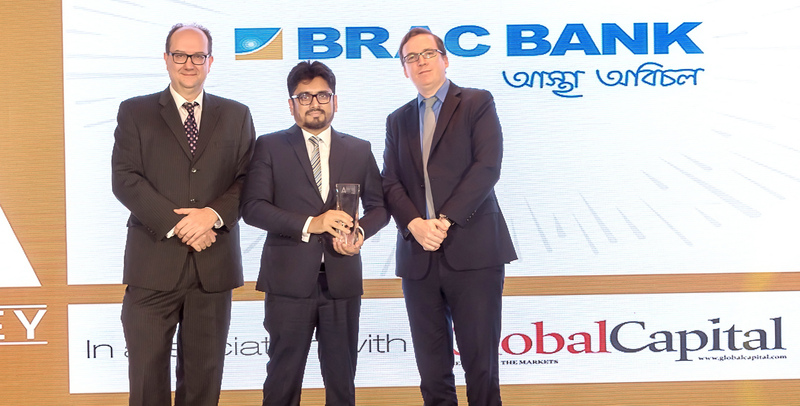 The UK-based media outfit has conferred the prestigious award to a bank that has pioneered SME financing in Bangladesh. BRAC Bank is now the largest financier of collateral free SME loans in the country. With its unique network of SME Unit Offices, the bank has taken small ticket loans to the doorsteps of the cottage, small, micro and medium entrepreneurs across the country. Over the years, BRAC Bank has become synonymous with SME financing. Mr. Syed Abdul Momen, Head of SME Banking, BRAC Bank, formally received the award from Mr. Sunil Bhat, Director, International Finance, at the “International Finance Awards 2018”, held at Grand Hyatt Erawan Hotel in Bangkok, Thailand on January 25, 2019. Upon receiving this international award, BRAC Bank’s Managing Director & CEO, Mr. Selim R. F. Hussain said that the bank’s unique SME network, business-oriented products and passionate employees have all been instrumental to winning the recognition. BRAC Bank’s SME Banking cuts across cottage, small, micro, medium and emerging business segments with customized solutions. With its network of 460 SME Unit Offices and dedicated CROs and RMs, the bank takes financing solutions to the doorsteps of the SME entrepreneurs in rural and semi-urban Bangladesh. He added that the award will truly inspire the bank to take SME financing to newer heights. Mr. Hussain concluded by reiterating the fact that BRAC Bank will continue its march towards its ultimate goal of becoming the best bank of the country. 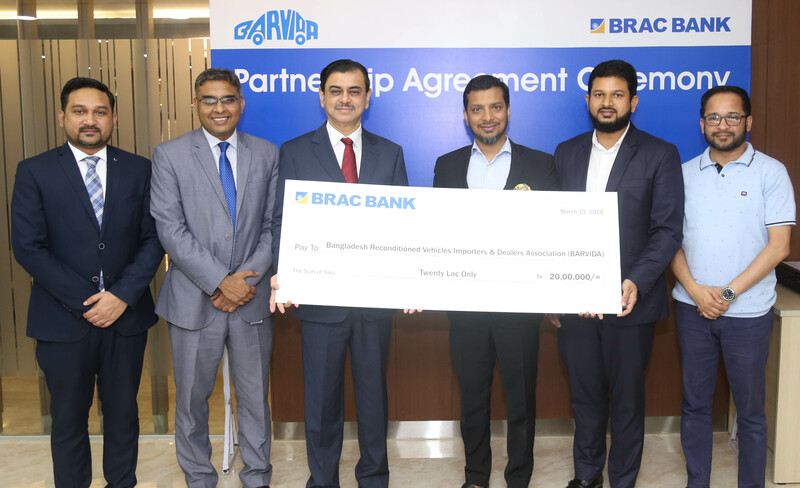 Dhaka, Tuesday, February 26, 2019: BRAC Bank Limited and PRAAVA HEALTH Bangladesh Limited, have signed a partnership agreement for providing discount benefit to all BRAC Bank cardholders and employees. Sabrina Imam, Director, IT & Corporate Marketing, PRAAVA HEALTH Bangladesh Limited along with other senior officials of the company and Mr. Dewan Imteaz Ahmed, Head of Retail Lending Products, Mr. Taher Hasan Al Mamun, Regional Head, Dhaka Central and South East Region, and others from BRAC Bank were also present at the signing ceremony in Dhaka on February 18, 2019. PRAAVA HEALTH is a network of family health centers raising the bar for healthcare in Bangladesh with international quality doctors, diagnostics, and technology. They offer consultations with family doctors, visiting specialists, and a full range of diagnostics services including lab and imaging. All the BRAC Bank cardholders and employees will enjoy discount upto 20% and exclusive package deals from PRAAVA Healthcare. Dhaka, Monday, February 25, 2019: BRAC Bank Limited organized a workshop on “Prevention of Money Laundering and Combating Financing of Terrorism” in Sylhet. A total of 171 officials of the Sylhet Region participated in the daylong workshop held at a city restaurant in Sylhet on February 9, 2019. Mr. Rais Uddin Ahmad, Company Secretary, Head of Regulatory Affairs & CAMLCO, and Mr. Mohammad Lutful Haque, Deputy CAMLCO, BRAC Bank, conducted the session. BRAC Bank Limited organizes workshop for awareness on Prevention of Money Laundering and Combating Financing of Terrorism among its officials at different part of the country under the directive of Bangladesh Bank. The employees of BRAC Bank Limited have come forward to light up the curious minds of underprivileged children by donating them with books. BRAC Bank partnered with globally recognized NGO, Teach For Bangladesh, also a valued employee banking customer of the bank, to launch a book collection campaign at the bank. Under the month-long campaign, the employees of the bank generously donated old/used books in thousands. As a values-based organization, BRAC Bank is aware of its corporate responsibility to educate the next generation, especially the less fortunate segment, for building a prosperous nation. This noble initiative goes with the bank as ‘enlightening Bangladesh’ is one of key corporate vision of the bank. Ms. Maliha Fawzia, Program Director, Teach For Bangladesh, formally received the books from Bilquis Jahan, Head of Human Resources, BRAC Bank, on January 29, 2019 at BRAC Bank Head Office in Dhaka. Ms. Shaila Nusrat, Community Engagement Manager, Teach For Bangladesh, Mr. Muniruzzaman Molla, Head of Operations, BRAC Bank, and senior officials of both the organizations are present at the book handover ceremony. BRAC Bank and Al Haramain Hospital, Sylhet signed a corporate agreement. Under the agreement, Al Haramain Hospital will provide exclusive healthcare services to the valued customers and employee of BRAC Bank. From Al Haramain Hospital, Managing Director Dr. Mohammad Ehsanur Rahman, Director (Medical Services) Dr. M. Faiz Ahmed, Assistant Director Dr. Nahian Ahmed Chowdhury, Manager (Marketing) Reazul Mahmud, and from BRAC Bank, Head of Large Corporate, Unit 1 Sajid Rahman, Cluster & Sylhet Branch Manager Anup Kanti Das and Zindabazar Branch Manager Shafayet Hussain Ahmed were present at the agreement signing ceremony at the hospital on February 18, 2019. Dhaka, Wednesday, March 6, 2019: BRAC Bank Limited and VIBES Healthcare (Bangladesh) PVT. Ltd, a leading weight management, beauty and laser clinic in Bangladesh, have signed a partnership agreement to provide special privileges for the bank’s Bank Premium Banking and TARA customers. Under the agreement, VIBES Healthcare will provide up to 50% discount on services & exclusive packages to BRAC Bank Premium Banking Debit, Signature & Platinum Credit Cardholders and TARA Debit & Credit Cardholders and Employees of the bank. Aanchal Sharma, Regional Head, VIBES Healthcare Bangladesh, and Nazmur Rahim, Head of Retail Banking, BRAC Bank, signed the Memorandum of Understanding at the bank’s Head Office in Dhaka on March 04, 2019. Abu Sayem Ansari, Head of Premium Banking, Dewan Imteaz Ahmed, Head of Retail Lending, Mehruba Reza, Senior Product Manager, Women Banking Segment TARA and K.M. Nafizul Hoq, Head of Product and Proposition, Premium Banking, BRAC Bank, were also present at the signing ceremony. Dhaka, Thursday, March 7, 2019: BRAC Bank Limited has introduced ‘TARA Awards 2019’ to recognize contribution of its women customers to society and economy. The award is named after its comprehensive women’s banking solutions, TARA, which provides tailor-made financial solutions to women of every strata of the society. Six TARA customers won the first TARA Awards in recognition of their outstanding contribution to development of society and country’s economy. Forat Jahan Shathi of Dhanshiri Trade International received the award in Dynamic category, Jannatul Ferdoushi Rupa, Advocate of Bangladesh Supreme Court in Courageous category, Sharmin Hossain, Surgeon, Obstetrics and Gynecology in Visionary category, Shaheenoor Sheli of Sheli Colour & Fabrics in Inspirer category, Ukroyaungo Marma of System Restaurant in Explorer category, Tanjila Parvin of Priya Fashion in Creative category while Zaiba Tahyya of Female Empowerment Movement in Aspirer category. The Category ‘Aspirer’ was exclusively focused on the external youth leader in order to encourage the youth segment in their social contribution. 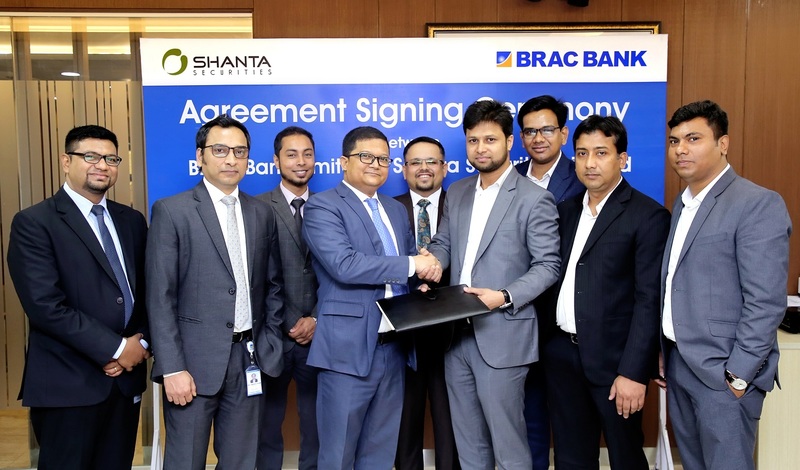 Dhaka, Monday, March 11, 2019: BRAC Bank has signed an agreement with Sheba.XYZ, a leading digital platform for service providers in the country. The partnership is aimed at jointly designing banking products for the registered service providers of Sheba.XYZ. 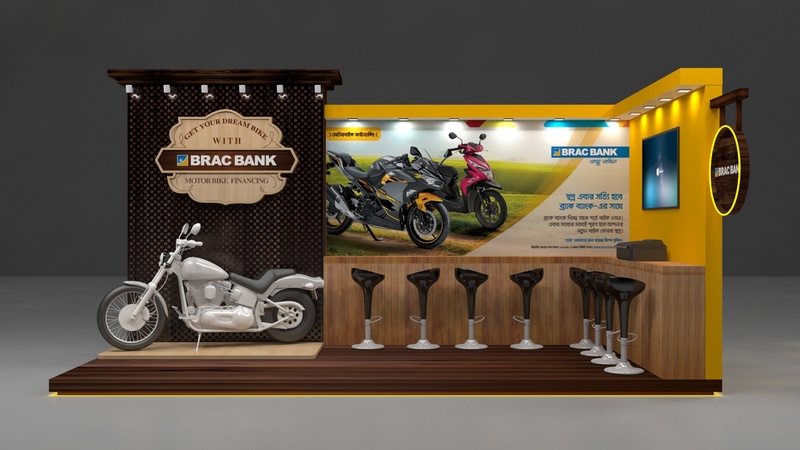 This is a unique initiative which will help the bank tap into the micro and small segment of the booming service industry of the country conforming BRAC Bank’s ethos of financial inclusion. Mr. Indrajit Sur, Head of Emerging Corporate, Mr. S M Alomgir Hossain, Head of Small Business East, Mr. SK Moinul Hassan, Head of Underwriting – EC, Mr. Biplab Kumar Biswas, Head of Underwriting SB, Mr. Shah Alam, Head of Business Support and Women Entrepreneur Cell and Mr. Shajed Al Haque, Senior Manager, Business transformation and Head of Trade business, BRAC Bank, were present at the signing ceremony. BRAC Bank Limited and Bangladesh Bank jointly organized a “View Exchange Program on Small and Medium Sized Enterprise Development Program 2 (SMEDP2)”. BRAC Bank is one of the Participatory Financial Institute (PFI) under this refinancing scheme amounting to US$ 240 million. Mr. Andullah Al Masud, Project Officer & Deputy Director; Mr. Tarikul Isalm, Project Joint Director; Mr. Md. Rezaul Karim Sarker, Deputy Project Director and DGM; Bangladesh Bank, conducted the session for BRAC Bank officials at its Head Office on March 2, 2019. Dhaka, Thursday, March 21, 2019: BRAC Bank Limited has partnered with Bangladesh Reconditioned Vehicles Importers & Dealers Association (BARVIDA). Under this partnership, BRAC Bank will provide support to organize Silver Jubilee of the association. BARVIDA is celebrating 25th founding anniversary of the association with a theme “Safe Drive, Save Life” to enhance public awareness on road safety. Mr. Md. Habib Ullah Dawn, President, BARVIDA, and Mr. Selim R. F. Hussain, Managing Director & CEO, BRAC Bank, were seen in the photograph. 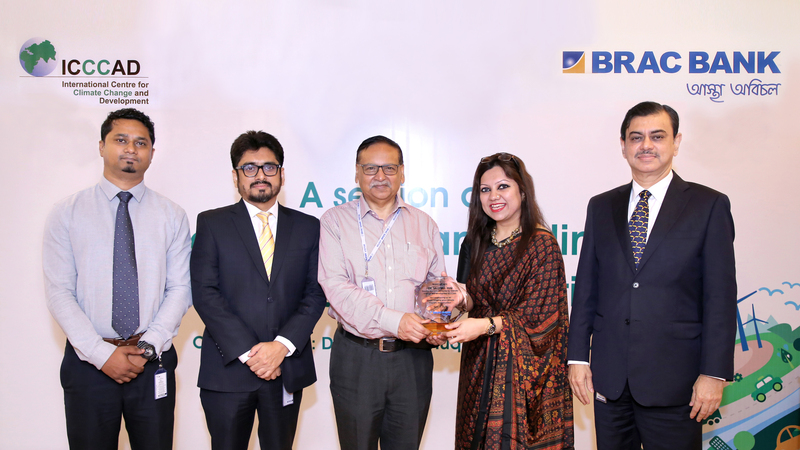 Mr. Nazmur Rahim, Head of Retail Banking, Mr. Mahabubul Farook Khan, Head of Sales, Auto Loan, BRAC Bank, were also present at the ceremony held at BRAC Bank Head Office on March 20, 2019. Dhaka, Tuesday, March 26, 2019: BRAC Bank Limited and Carnival Internet, a brand of SSD-tech Ltd. and a leading internet service provider in Bangladesh, have signed a partnership agreement. Mr. Zaman Md. Bahadur Khan, Executive Director of Systems Solutions & Development Technologies (SSD-tech) Ltd. and Mr. Siraj Siddiquey (Shakil), Head of Digital Banking and E-commerce, Retail Banking, BRAC Bank, exchanged the Memorandum of Understanding on behalf of respective organization at BRAC Bank Head Office, Anik Tower on March 21, 2019. Dhaka, Wednesday, March 27, 2019: BRAC Bank Limited has earned a net profit (Profit after tax) growth of 5.7% in 2018 on standalone (Solo) basis compared to 2017. On consolidated basis, the bank has recorded a net profit growth of 3.1% in year-on-year in 2018 over last year. BRAC Bank reported a net profit after tax of BDT 5,670 million (consolidated) and BDT 5,547 million (standalone) in 2018, increasing from BDT 5,498 million (consolidated) and BDT 5,250 million (standalone) respectively. However, the operating profit decreased to BDT 9,393 million (consolidated) and BDT 8,822 million (standalone) from BDT 9,422 million (consolidated) and BDT 9,050 million (standalone) respectively, reported last year. The consolidated Earnings Per Share (EPS) of the bank rose to BDT 5.17 in 2018 from BDT 4.86 in 2017. The Earnings per Share (EPS) of the bank on standalone basis also rose to BDT 5.17 in 2018 from BDT 4.91 in 2017. The net asset value (NAV) per share on consolidated basis at the end of December 2018 stood at BDT 32.87, compared to BDT 24.80 at the end of December 2017. The net asset value (NAV) per share on standalone basis at the end of December 2018 stood at BDT 29.50, compared to BDT 24.23 at the end of December 2017. BRAC Bank formally announced financial results of 2018 in an earnings disclosure program at its head office in Dhaka on March 27, 2019. Local and foreign Investment analysts and capital market experts participated in the program which was also broadcast live on the internet for overseas stakeholders. Selim R. F. Hussain, Managing Director & CEO, BRAC Bank Limited, presented the financial results and then answered queries in a Q&A session. Tareq Refat Ullah Khan, Head of Corporate Banking; Nazmur Rahim, Head of Retail Banking; Syed Abdul Momen, Head of SME Banking; Shaheed Iqbal, Head of Treasury & FIs, and Mohammad Abdul Ohab Miah FCA, Acting Chief Financial Officer, and senior officials of the bank were also present. Dhaka, Sunday, March 31, 2019: BRAC Bank Limited and Shanta Securities Limited have signed a custodial agreement. Under this agreement BRAC Bank will be extending its custodial services to the foreign clients of Shanta Securities Limited who are planning to invest in the Bangladesh capital market. Shanta will also be introducing foreign potential custodial clients to BRAC Bank and will also provide brokerage services to the clients. Mr. Tareq Refat Ullah Khan, Head of Corporate Banking, BRAC Bank Limited, and Mr. S.M. Habibur Rahman, Chief Operating Officer, Shanta Securities Limited, signed the agreement on behalf of their respective organizations. Mr. Jabedul Alam, Head of Trade Development & Cash Management, Mr. Fahim Ishtiaque Hossain, Unit Head, Trade Development & Cash Management, BRAC Bank Limited and Mr. Md. 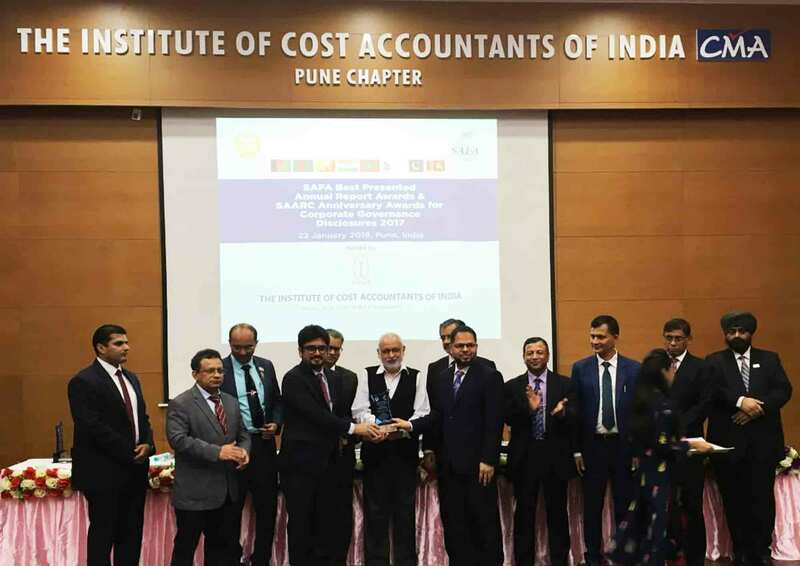 Abdur Rahim, Head of IT, Shanta Securities Limited, along with other officials from both the organizations were present at the signing ceremony in Dhaka on March 19, 2019. BRAC Bank Limited has congratulated Bangladesh Reconditioned Vehicles Importers & Dealers Association (BARVIDA) on the auspicious occasion of its Silver Jubilee. Mr. Selim R. F. Hussain, Managing Director & CEO, BRAC Bank, handed over a plaque to Mr. Md. Habib Ullah Dawn, President, BARVIDA, at a ceremony in presence of Mr. Tipu Munshi M.P., Hon’ble Commerce Minister, Govt. of the People’s Republic of Bangladesh, and Mr. Md. Shafiul Islam (Mohiuddin), President, Federation of Bangladesh Chamber of Commerce and Industry (FBCCI). Mr. Chowdhury Akhtar Asif, DMD&CRO; Mr. Nazmur Rahim, Head of Retail Banking; Mr. Syed Abdul Momen, Head of SME Banking; and Mr. Mahabubul Farook Khan, Head of Sales, Auto Loan, BRAC Bank, were also present at the association’s 25th founding anniversary at BICC, Agargaon, Dhaka on March 21, 2019. BRAC Bank was partner of BARVIDA on the founding anniversary with a theme “Safe Drive, Save Life” to enhance public awareness on road safety. 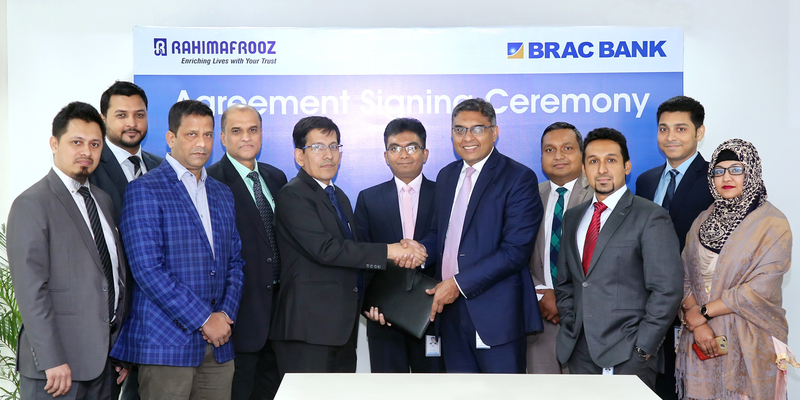 Dhaka, Wednesday, April 3, 2019: BRAC Bank Limited and Rahimafrooz Distribution Limited have signed an e-commerce agreement. Under this agreement, BRAC Bank debit and credit cardholders will enjoy 10% discount in all products and services available at estore.rahimafrooz.com till July 15, 2019. Mr. Nazmur Rahim, Head of Retail Banking, BRAC Bank Limited and Mr. Shankar Chandra Karmaker, General Manager, Finance, Rahimafrooz Distribution Ltd. (RDL), signed the agreement on behalf of their respective organizations. Mr. Siraj Siddiquey (Shakil). Head of Digital Banking & E-commerce; Mr. Sultan Mahmud Sarkar, Senior Manager from BRAC Bank Limited; and Mr. Mokhlesur Rahman, GM & Head of Sales & Marketing-Tyre; Mr. Md. Khaled Hossain, Head of Sales & Marketing-EPP; from Rahimafrooz Distribution Ltd.; were present at the signing ceremony held at BRAC Bank Head Office in Dhaka on April 2, 2019. 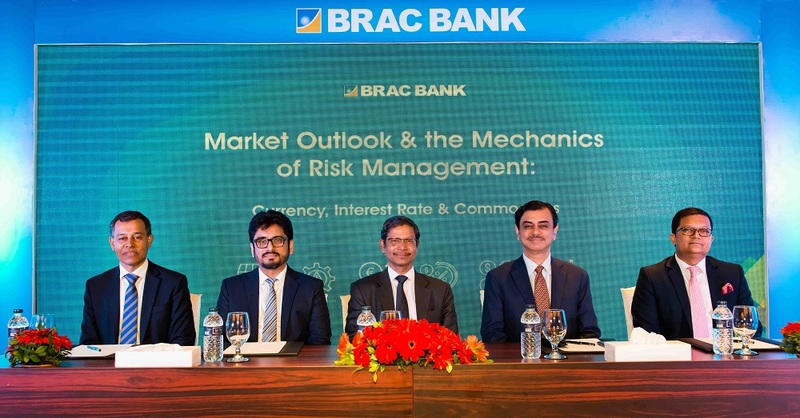 Dhaka, Tuesday, 16 April 2019: BRAC Bank Limited organized a seminar on “Market Outlook and The Mechanics of Risk Management: Currency, Interest Rate & Commodities”. Mr. Ahmed Jamal, Deputy Governor, Bangladesh Bank; graced the event as the chief guest. Mr. Selim R. F. Hussain, Managing Director & CEO; Mr. Chowdhury Akhtar Asif, Deputy Managing Director & CRO; Mr Md. Shaheen Iqbal, Head of Treasury & Financial Institutions; and Mr. Tareq Refat Ullah Khan, Head of Corporate Banking; BRAC Bank; were present. Senior Management of top corporate houses of the country participated in the seminar. Mr. Mohammad Khurshid Wahab, General Manager, Foreign Exchange Policy Department (FEPD); and Mr. Md. Bayazid Sarker, Deputy General Manager, Foreign Exchange Policy Department (FEPD); Bangladesh Bank; were also present at the seminar on April 11, 2019 at InterContinental Dhaka. The seminar was targeted towards Wholesale Banking Clients particularly large corporate houses having significant exposure in foreign currency, commodities and floating rate foreign currency loans. Mr. Ahmed Jamal, Deputy Governor, Bangladesh Bank lauded the initiative of BRAC Bank on their timely organization of the seminar given the current volatile global market scenario. He praised BRAC Bank for executing the longest tenor Interest Rate Swap in Bangladesh Market. The Deputy Governor looked forward to many such sessions with corporate clients in the near future as well. Mr. Selim R. F. Hussain, Managing Director & CEO, BRAC Bank; commenced the session with a brief speech mentioning that global market conditions have now made it imperative for corporates to hedge against any losses from market risk arising from their exposures to exchange rates, foreign currency interest rates and commodity prices. He emphasized that BRAC Bank has a host of financial derivatives solutions to cater to any requirements that the corporate houses may have. Treasury professionals of BRAC Bank then illustrated the different risks arising from adverse movements in the exchange rate, interest rates and commodity prices and simultaneously explained the supporting derivative solutions they provided to hedge against those risks. Corporate clients engaged in a lively discussion with the presenters and senior officials of Bangladesh Bank on the issue. Noakhali, Tuesday, April 16, 2019: Bangladesh Bank organized 'Bankers-SME Entrepreneurs Conference and Open Loan Distribution Program’ in Noakhali. The conference was aimed at promoting and developing small and medium enterprises (SME) sector in the district. The day-long conference was held in Noakhali Sadar Upazila Parishad Auditorium on April 15, 2019. Md. Abdur Rahim, Executive Director, Bangladesh Bank; was present at the conference as the chief guest. Advocate Shihab Uddin Shahin, Chairman of Maijdee Sadar Upazila Parishad, Syed Abdul Momen, Head of SME Banking Division; Mr. Indrajit Sur, Head Emerging Corporate; S M Alomgir Hossain, Head of Small Business-East; Md. Shah Alam, Head of Business Support; Md. Hasan Morshed, Manager, Maijdee SME Krishi Branch; BRAC Bank; and senior officers of other banks were present at the conference. BRAC Bank was the coordinator of the conference. A total of 25 banks and financial institutions of Noakhali district participated in the conference and around BDT 7 crore SME loan was distributed to 60 SME entrepreneurs in the conference. Bangladesh Bank has long been organizing 'Bankers-SME Entrepreneurs Conference and Open Loan Distribution' program regularly in different districts to boost SME industry. Dhaka, Thursday, April 18, 2019: BRAC Bank Limited organized a workshop on "Green Finance and Climate Finance Opportunities" for its senior officials. Mr. Saleemul Huq, Director, International Centre for Climate Change and Development (ICCCAD), conducted the session at the bank’s Head Office in Dhaka on April 17, 2019. The session focused on international practice in green financing and the opportunities the climate finance is creating for banking sector in the light of climate change. Chowdhury Akhtar Asif, Deputy Managing Director & CRO, members of Sustainable Finance Committee and Sustainable Finance Unit and senior officials participated in the workshop. As a values-based organization and a member of the Global Alliance for Banking on Values (GABV), BRAC Bank believes in the philosophy of people, planet and prosperity. BRAC Bank is strongly committed to green banking for a sustainable future. 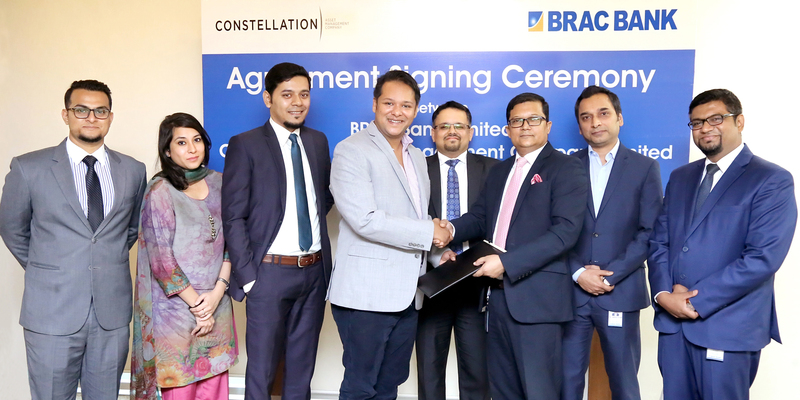 Dhaka, Wednesday, April 17, 2019: BRAC Bank Limited and Constellation Asset Management Company Limited have signed a Custodial Service Agreement to manage the mutual fund titled “Constellation Unit Fund”. Under this agreement, BRAC Bank Limited will be providing custodial services to Constellation Asset Management Company Limited for the operation of the mutual fund. Mr. Tareq Refat Ullah Khan, Head of Corporate Banking, BRAC Bank Ltd; and Mr. Shakil Rahman, Managing Director, Constellation Asset Management Company Limited; signed the agreement on behalf of their respective organizations. Mr. Jabedul Alam, Head of Trade Development & Cash Management, Mr. Fahim Ishtiaque Hossain, Unit Head, Trade Development & Cash Management, BRAC Bank Limited and Ms. Anisa Amir Ali, Strategic Investment Manager, Constellation Asset Management Company Limited; along with other officials from both the organizations were present at the signing ceremony at the bank’s Head Office in Dhaka April 11, 2019.